The modern home serves as more than just a place to put your feet up; it acts as an extension of your personality and tastes. The Endurance range of composite doors leaves you spoilt for choice when it comes to making your front door your own personal canvas, offering 75 unique door styles, 18 beautiful colours, and a comprehensive range of beautiful glazing options and accessories to add the finishing touches. To help you visualise just how your dream door will look on your home, we offer the modern and practical HomeView Door Designer. With this tool, you’ll be able to create your ideal door from our full selection and superimpose an image of it onto a picture of your own home. It’s never been easier to bring something special to your home. With customisation in mind, the current trend is moving away from the classic white uPVC styling and more towards something with a splash of colour. 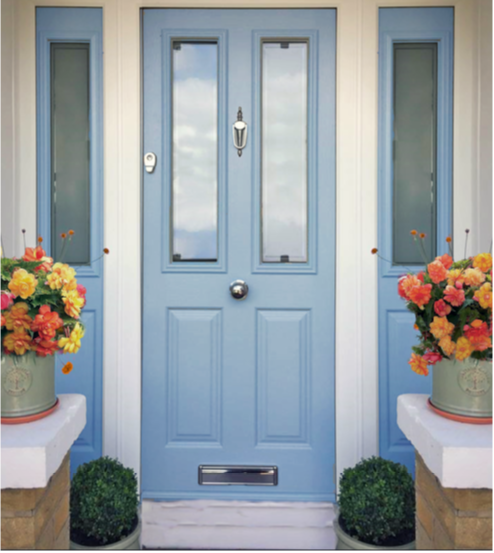 Popular options in this area include Duck Egg Blue, which is ideal for bringing a subtle dash of colour, and Anthracite Grey: a striking complement to any door in the Endurance range. Further to this, the colours in our range can be complemented or contrasted with a range of external decorative options. The most popular, and effective, of these are coloured plants. Adding these to your home allow you to bring a dynamic flair to your property, offering you the chance to enjoy a seasonal feel as you change the plants according to the time of the year. 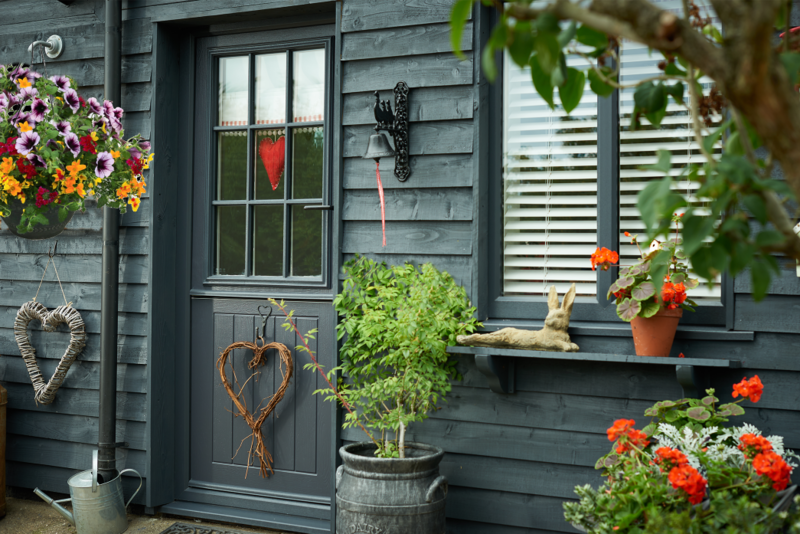 This beautiful door comprises the stable design, decorated in the sleek and stylish Anthracite Grey. Defined as the ‘Rushmore Georgia Stable Door’ in the Endurance range, this option proved to be the perfect solution for matching the property’s individuality. Their locally Preferred Installer was also able to colour match the door to the windows and painted exterior for a seamless installation. We can also see how the owner of this property has used a choice of accessories and ornaments to complement the door, drawing out the best in the inherent rural charm of the home. This is then completed with a very deliberate choice of plant options, offering a simple burst of colour that works to contrast against the darkness of Anthracite Grey. 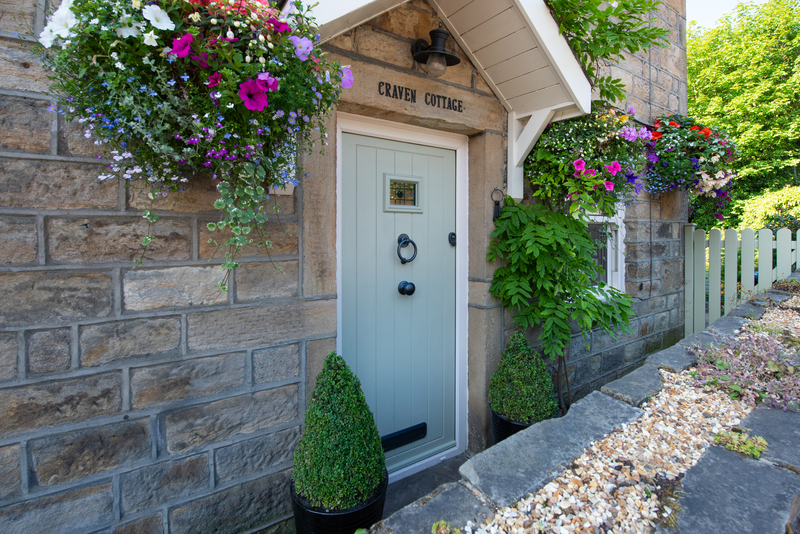 The classic choice of door style and glazing works in harmony to bring a heritage feel to the property, complemented further by the subtle tone of Duck Egg Blue. As an interesting and appealing choice, this colour works to create a welcoming focal point to the property the exudes a sense of class and luxury for both homeowner and visitor alike. The plant choice, a vibrant orange, works against the calming blue to add a colourful and exciting element to the entranceway. These two elements create the perfect recipe for instant kerb appeal, bringing the best of both worlds to the front of the home. We can also see how the choice of chrome hardware adds a subtle, but notable, finishing touch to the whole design. Capturing the quintessential British charm, this country-chic Endurance door combines shiplap styling, heritage style hardware, and traditional glazing placement to bring a taste of the English countryside right to the front door. This is then complemented further with the colour choice, a subtle colour that pairs perfectly with a cream frame: matching the porch and window frames. 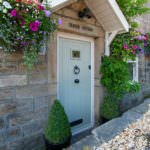 Here, we can see that the homeowner has chosen simple greenery to enhance the delicate green tone in the door’s colour. They have also opted for bright, colourful hanging baskets which help to complete the look with pink and purple flowers standing out distinctly from the greenery. It proves to be a beautiful blend that really catches the eye. If you’ve been inspired by our list, why not get in touch with us today to get the ball rolling on your new home. You can visit our HomeView Door Designer, or speak to a member of our friendly team, to find your perfect new door.